Model Change of YZF-R15 for the Indian Market | Yamaha Motor Co., Ltd.
Yamaha Motor Co., Ltd. introduces the 2012 model change of the Indian market model YZF-R15, a sport motorcycle designed and engineered in line with the technical ideals of the YZF-R1 and R6 supersport models and powered by a 150cc liquid-cooled, 4-stroke, fuel injected engine. This model will be released on the Indian market in the autumn of 2011. In the Indian market where the mainstream motorcycles are primarily seen as little more than a vehicle for commuting, the YZF-R15 was launched in 2008 as a model "bred for riding enjoyment" and thus brought a new concept of motorcycle value to the Indian market. Since then this model has won a following as the first full-fledged supersport model in the 150cc class, offering YZF-R series-based styling, sporty performance, a comfortable, enjoyable ride and ease of use in the urban riding environment. The concept behind the 2012 model change is an "Up-graded R15" that provides a further evolution of the existing model's basic performance while redesigning the body styling and boosting performance in sporty riding. In addition to changes in the ECU (Engine Control Unit) control settings that have improved acceleration and high-speed range performance, a longer aluminum swing arm and rear radial tire have been adopted. These changes, in combination with the new middle cowl design with improved aerodynamics in the high-speed range and lighter construction, boost performance while also serving as elements in the new, sporty styling. India is the world's second largest motorcycle market with a current annual demand of more than 12 million units. Strong economic growth based on healthy domestic demand and a growing urban middle income demographic are expected to support continued motorcycle market growth in the future. About 80% of demand in the Indian market is for motorcycle type models of the 100cc to 200cc class, while the remaining 20% is primarily for scooters of the 125cc class and under. The leading customers in the motorcycle model category are young people in their twenties with a strong preference for European trends, and a growing number are interested in luxury products or longing to "step-up" to products of the next higher grade of quality. This has created a strong trade-in demand and a growing interest in sport bikes. 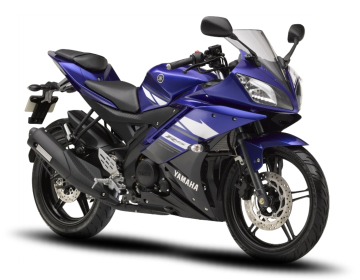 In this market the YZF-R15 was launched by Yamaha in 2008 as the first full-fledged supersport model in the 150cc class has won a broad-based following as a sport bike that enables riders to "enjoy riding" in environments ranging from city streets to winding roads and even on the race circuit. This popularity has helped establish a new 150cc supersport motorcycle category. Three years after the release of the original YZF-R15, a growing call has been heard from the market for a new YZF-R15 model with an even more sophisticated, sporty styling in the image of the YZF-R series. The 2012 model change responds to this call with a combination of even sportier performance and a new body design that boost product appeal. It has been planned and developed with the clear aim of becoming an even stronger leader in the supersport model category.